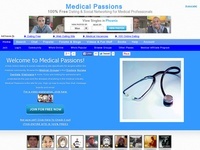 Medical Passions is a free online dating & social networking site for singles in the medical profession. If you are a doctor, a nurse or anyone who works in the medical field, this is the site for you. Join for free and take advantage of free personals, networking, email, chat, forums and more. Interested in dating a doctor? Are you doctor looking for singles who understand that along with the perks, there are also long hours and career responsibilities that come from practising within the medical profession? Single Doctors Dating was designed specifically to help connect doctors and those who are interested in dating doctors, so join for free and check it out. Are you a nurse looking for romance? Are you interested in meeting nurses for friendship or possibly more? Nurse Dating has been designed specifically for nurses (and those who are interested in them). It only takes a moment or to to join for free to see if this is the site for you. Straightforward and to the point, Doctor Dating Service is designed to connect doctors and those interested in dating doctors. If you are in the medical profession, or you are interested in dating someone who is, then take a minute to join. Enjoy a site for medical professionals built by medical professionals. If you are looking to connect for friendship, networking or romance, Med Pros Meet offers you that option.